This Asian/Pacific American Heritage Month we are excited to share special features with authors and editors of new and recent titles that celebrate Asian and Pacific Islanders in the United States. Today we feature a guest post from The Hope of Another Spring: Takuichi Fujii, Artist and Wartime Witness author Barbara Johns exploring some of the most powerful and intriguing pieces by Issei artist Takuichi Fujii (1891-1964). The Washington State History Museum in Tacoma will present the corresponding exhibition, Witness to Wartime: Takuichi Fujii, from September 21, 2017 – January 4, 2018. After the exhibition closes in Tacoma, it will travel to the Alexandria Museum of Art in Alexandria, LA from March 1 – June 27, 2018. Takuichi Fujii (1891-1964), Chicago, ca. 1953. 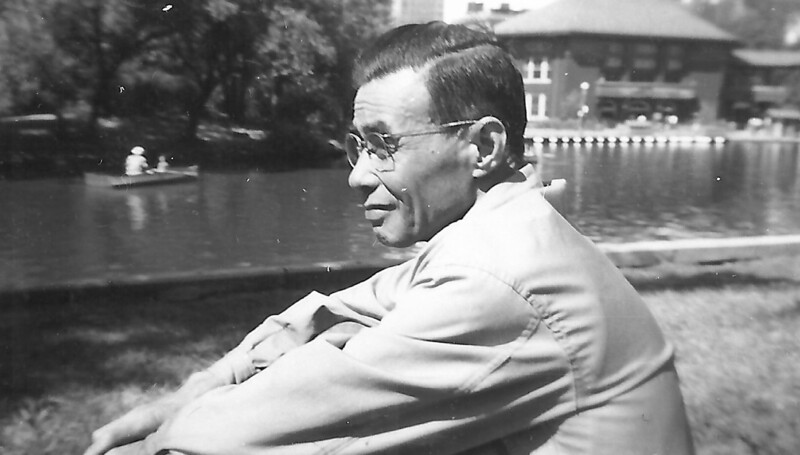 Fujii, pictured here in his early sixties, moved to Chicago after World War II. During the war Chicago became the center of Japanese America as the result of the War Relocation Authority’s resettlement policy. Fujii moved to the city after the war and spent the remainder of his life there. Photo courtesy of Sandy and Terry Kita. Fujii, High School Girl, ca. 1934-1935. Fujii immigrated from Hiroshima to Seattle at the age of fifteen, established a small fish sales business, and by the 1930s was a well-recognized artist. This painting pictures his daughter, a student at Broadway High School. Oil on canvas, 22 3/4 x 29 in. Wing Luke Asian Museum Collection. Photo: Richard Nicol. 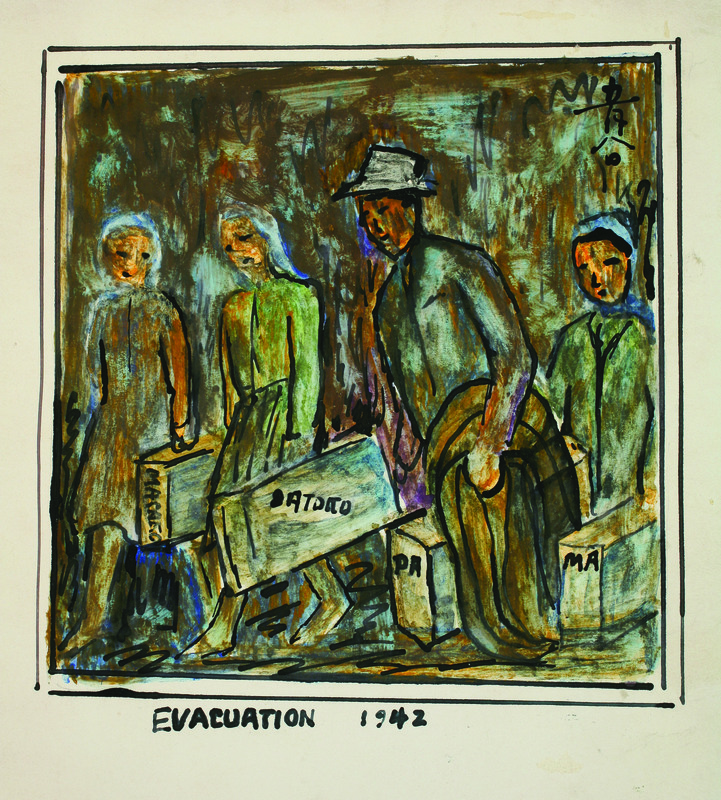 Fujii, Evacuation, 1942. Executive Order 9066, issued on February 19, 1942, authorized the army to establish military zones “from which any or all persons may be excluded,” targeting although not naming persons of Japanese ancestry. The mass forced removal began in late March, and by June, more than 110,000 Japanese Americans on the West Coast were incarcerated under armed guard. 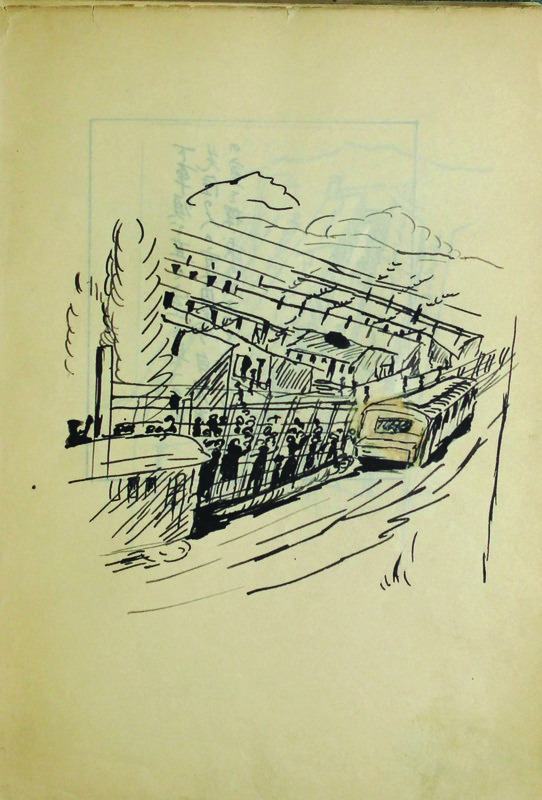 Fujii began an illustrated diary that he would keep throughout the war, and here, shows his family leaving home. Diary frontispiece. Ink and watercolor on paper, image 4 1/4 x 4 in. Sandy and Terry Kita Collection. Fujii, Diary entry, 1942. Fujii wrote, “We arrived at the Puyallup Assembly Center. 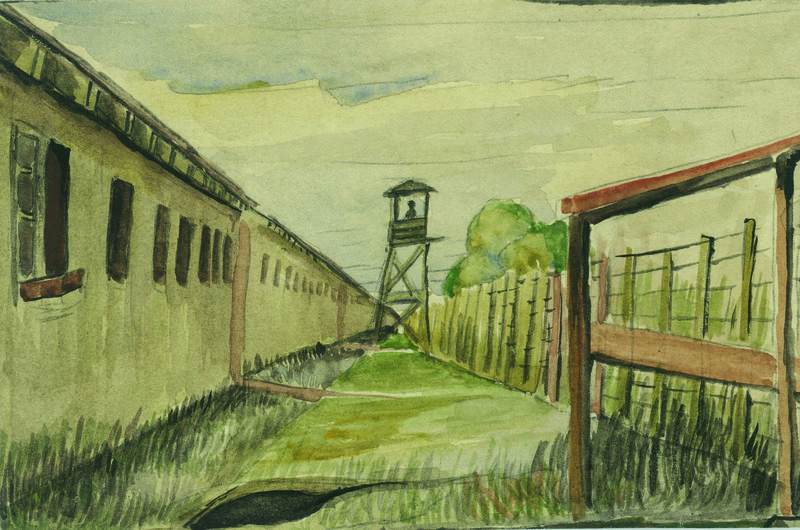 Those who had been sent here earlier greeted us from inside the barbed wire.” Fujii’s diary, nearly four hundred pages of text and images, gives a detailed account of the “camp” experience from an inmate’s perspective. Ink on paper, 8 x 5 1/2 in. Sandy and Terry Kita Collection. Puyallup Assembly Center, Washington, 1942. 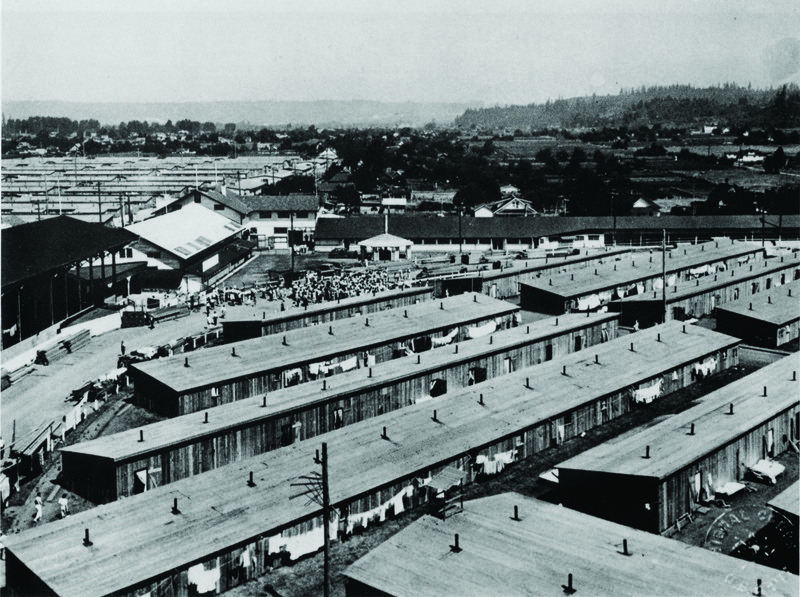 Crudely built barracks on the Western Washington Fairgrounds and surrounding area housed more than 7,000 Japanese Americans from May to September. Meals, latrines, showers, and laundry were communal. Inadequate plumbing, noise, endless lines, and mandatory roll call were daily conditions. Denshō, courtesy of Library of Congress Prints and Photographs Division, LC-USZ6-1654, http://encyclopedia.densho.org/sources/en-denshopd-i217-00021-1/. Fujii, Puyallup Assembly Center. 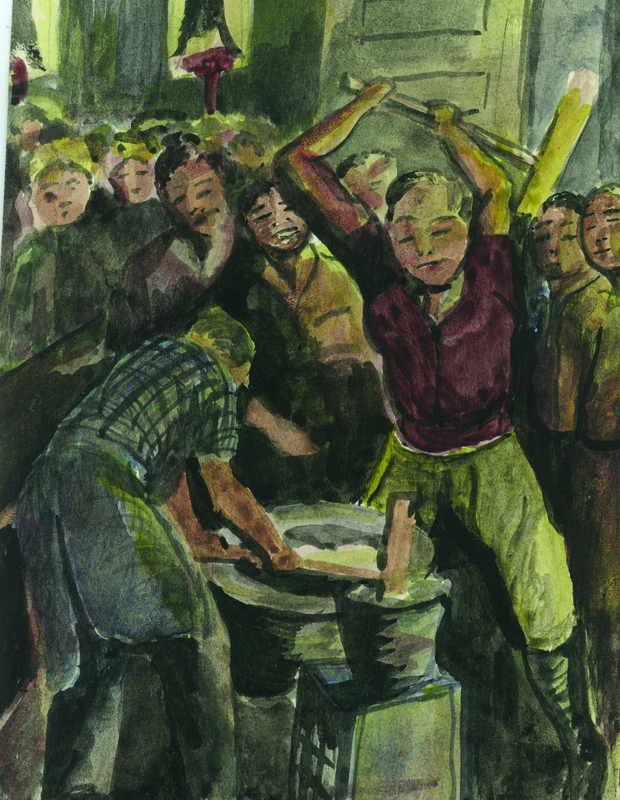 In addition to his diary, Fujii produced well over one hundred watercolors that replicate or complement the diary drawings. 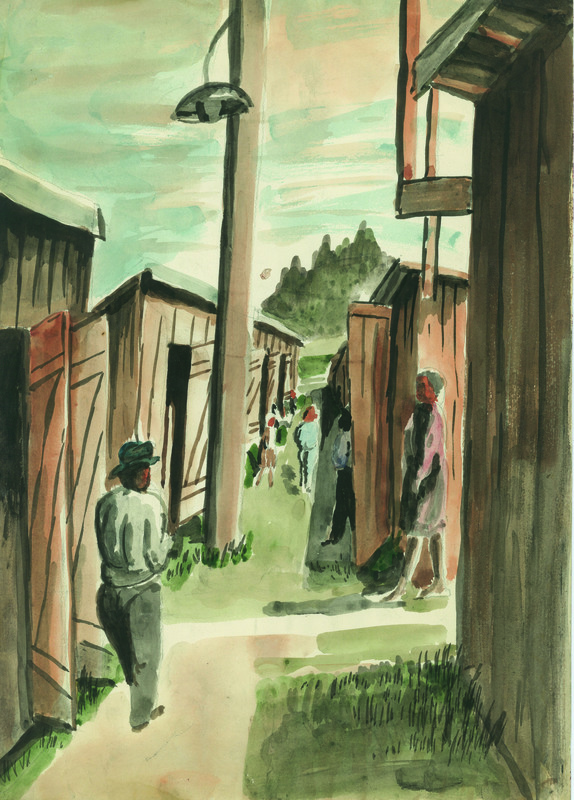 He writes in the diary entry on which this watercolor is based, “The south side of the camp: the place where there was a tall watchtower.” His drawings and watercolors repeatedly trace the means of confinement and specify his viewpoint, positioning him as a witness. Watercolor on paper, 4 x 6 in. Sandy and Terry Kita Collection. Fujii, Puyallup Assembly Center, man standing by barracks. 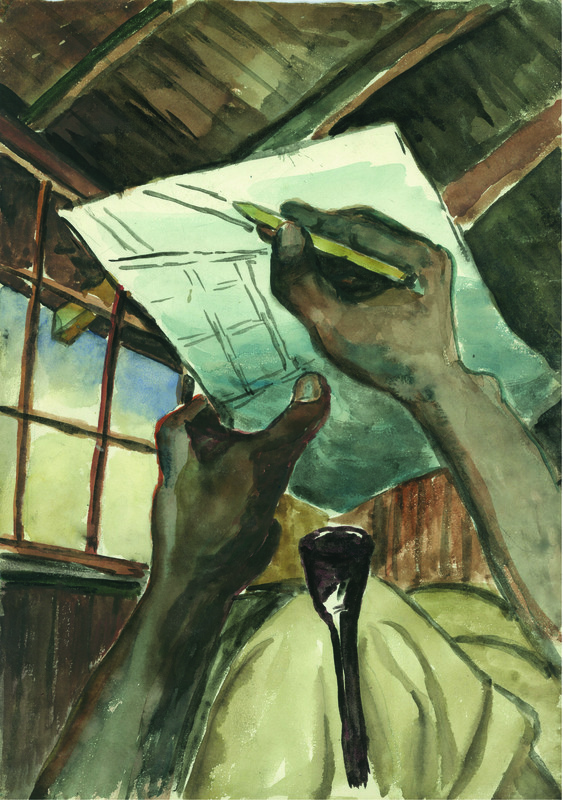 This watercolor enlarges a detail from the diary drawing, as Fujii continued to reflect on his experience. Watercolor on paper, 14 x 10 in. Sandy and Terry Kita Collection. Watercolor on paper, 13 1/2 x 10 in. Sandy and Terry Kita Collection. Watercolor on paper, 6 1/4 x 4 1/2 in. Sandy and Terry Kita Collection. Fujii, Minidoka, drawing by flashlight. 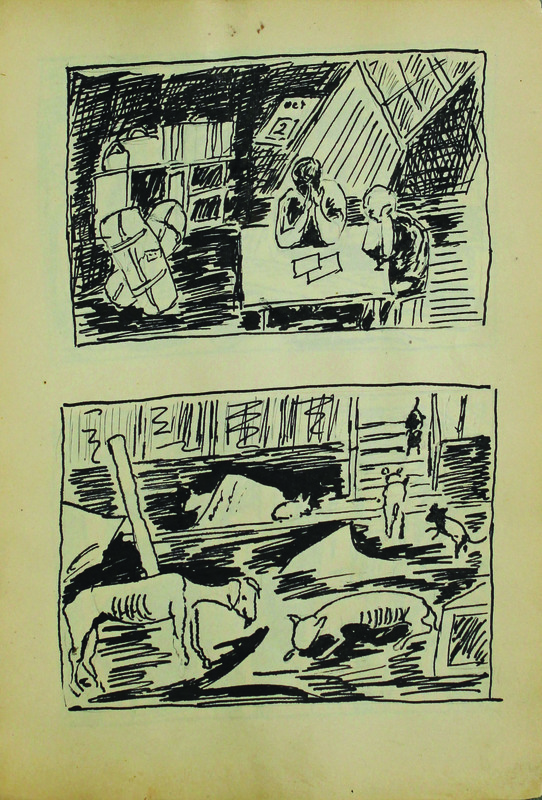 Fujii pictures himself in usual perspective as he draws inside his barrack, as if to make the viewer a witness alongside him. Watercolor on paper, 14 3/4 x 10 in. Sandy and Terry Kita Collection. Fujii, double portrait of himself and his wife, Fusano (on the left), ca. 1943-1945. 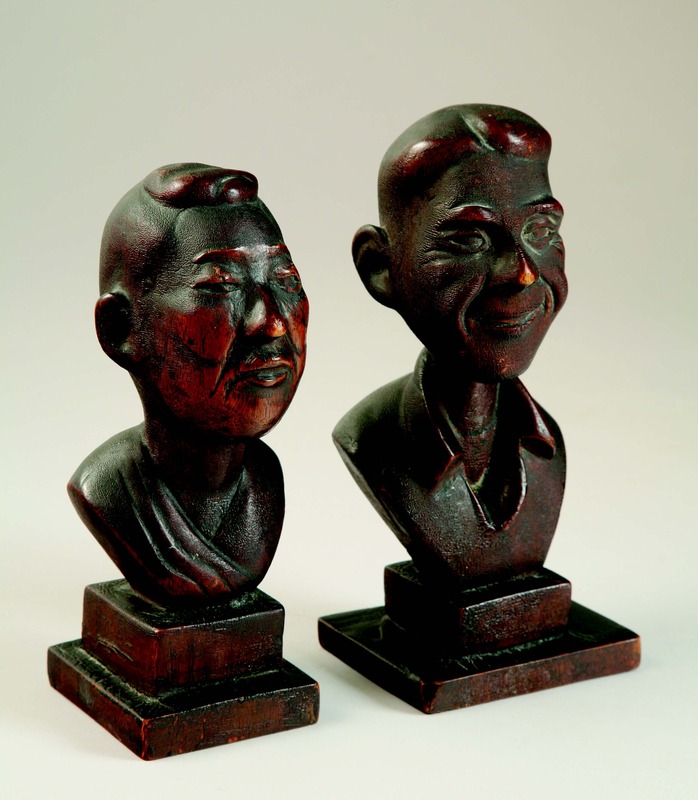 This unique sculpted pair shows the strong, supportive union between Fujii and his wife. The dimensions suggest the wood was scavenged from fence posts when a portion of the hated barbed-wire fence was dismantled. Carved wood, the taller, 9 x 4 x 3 1/4 in. Sandy and Terry Kita Collection. Photo: Richard Nicol. Fujii, Diary entry, Minidoka, October 2, 1945. Fujii and his wife, having received eviction papers, await their departure from Minidoka to an unknown future. 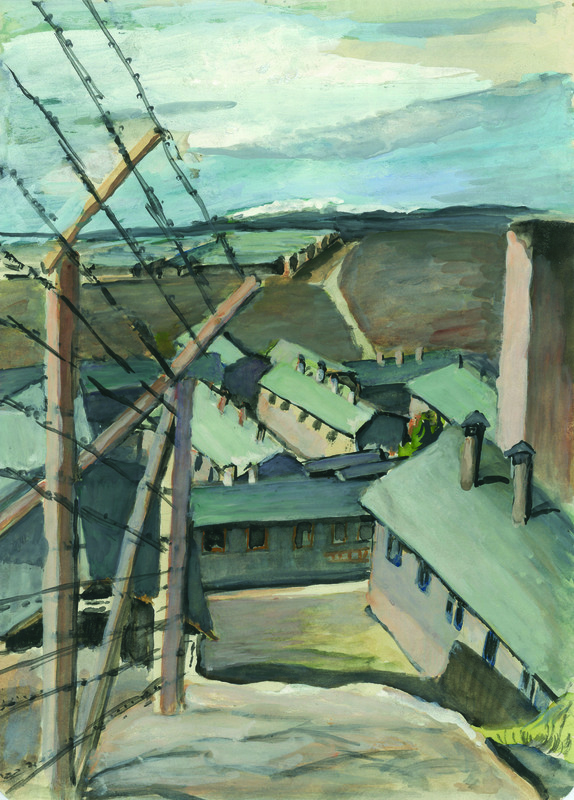 He describes the acute anxiety aroused by the announcement of the closure of the camps in 1945, particularly among the Issei, who had lost their homes, farms and businesses, possessions, and, for many of them, their health. His diary is exceptional in recording his experience from the forced removal in 1942 to his leaving Minidoka as the camp closed. Fujii, abstraction, early 1960s. 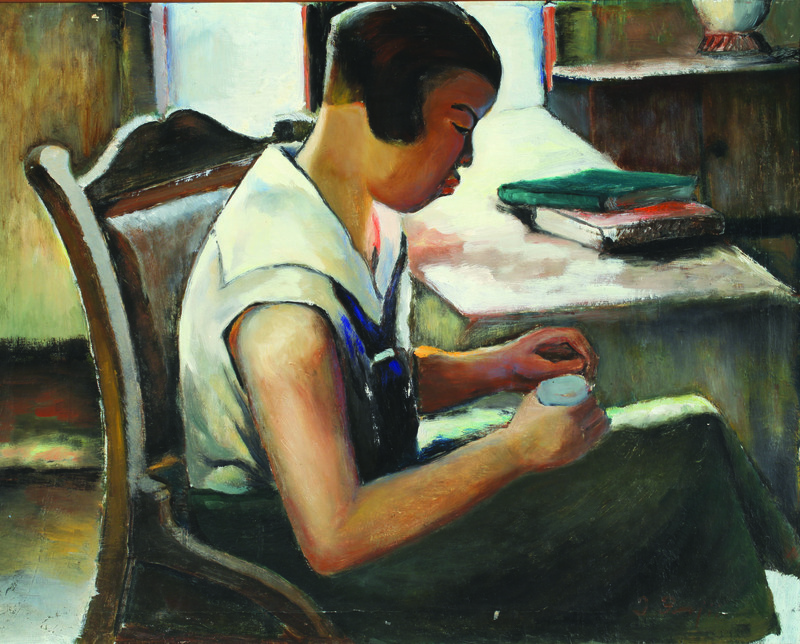 Moving to Chicago after the war, Fujii continued to paint and experimented with abstraction in a broad range of styles. 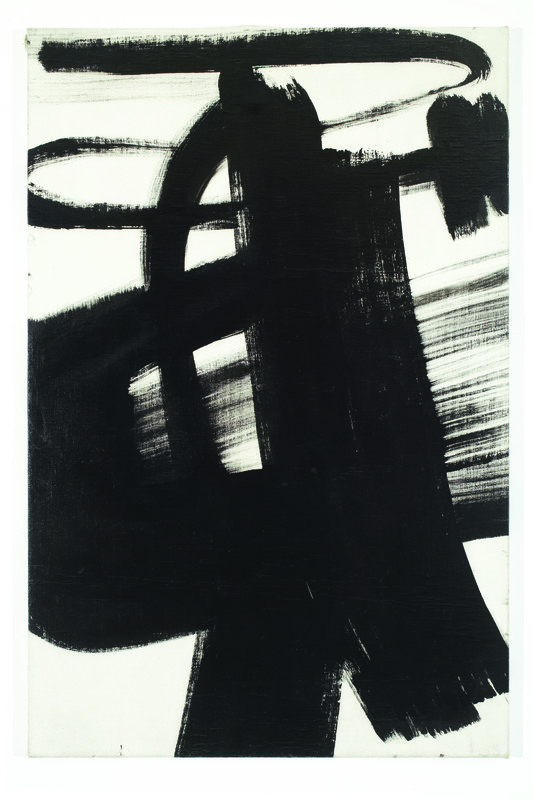 His work culminated in a series of bold, dynamic black and white abstractions in the last years of his life. Enamel on canvas, 24 x 36 in. Sandy and Terry Kita Collection. Photo: Richard Nicol. Barbara Johns, PhD, is a Seattle-based art historian and curator. Her previous books include Signs of Home: The Paintings and Wartime Diary of Kamekichi Tokita, Paul Horiuchi: East and West, Jet Dreams: Art of the Fifties in the Northwest, and Anne Gould Hauberg: Fired by Beauty. This entry was posted in Art and Art History, Asian American Studies, Events, Exhibitions on View, Guest Post, History, Japan, Memoir, Pacific Northwest, US History, Visual Studies, Western History and tagged Asian American Art, Barbara Johns, Pacific Northwest, Seattle, Tackuichi Fujii, The Hope of Another Spring on May 30, 2017 by uwpressblog. To honor Asian/Pacific American Heritage Month, Barnard College professor of history Dorothy Ko offers a peek into ancient and modern-day Eastern culture and politics. According to the Library of Congress, Asian/Pacific American Heritage Month takes place in May for two reasons: May 7, 1843, marked the immigration of the first Japanese citizen to the U.S.; and on May 10, 1869, the transcontinental railroad was completed, mostly by Chinese immigrant workers. Dorothy Ko explores the subjects of gender and body in early modern China. In her books, Ko unravels the complex worlds of Chinese footbinding (Cinderella’s Sisters: A Revisionist History of Footbinding), fashion (Every Step a Lotus: Shoes for Bound Feet), and feminism (Teachers of the Inner Chambers: Women and Culture in Seventeenth-Century China). Her latest, The Social Life of Inkstones: Artisans and Scholars in Early Qing China, introduces the West to the world of ancient Asian stones and includes close to 100 images (see slideshow below). Ko explains the significance of this highly specialized art form. What exactly is an inkstone and what is its significance in East Asian culture? An inkstone is a piece of polished stone about the size of an outstretched palm. Before the invention of fountain pens, let alone laptops and iPads, every student, writer, or painter in East Asia had to grind a fresh supply of ink at the desk by dipping an ink-stick in water and rubbing it on the surface of the stone. This process was as instinctive to them as recharging our iPhones is to us. Day in and day out, the writers and painters developed deep attachments to their implements. More than an instrument for writing, the inkstone was a collectible object of art, a father’s gift to his school-bound son, a token of friendship, and even a diplomatic gift between states. Why is this tool so unfamiliar to Western civilizations when it has represented so much for the East for more than a millennium? Europeans drew ink from an inkpot so they had no use for an ink-grinding stone. Nor did the early European collectors appreciate its subtle beauty as the Chinese connoisseurs did. The color of the inkstone tended to be deep purple or black; it is small and does not display well in a stately home or fancy apartment. So it is no wonder that there is no notable collection of inkstones in Europe or America. Your book shines a light on craftswoman Gu Erniang who became famous for her inkstone-making skills, which were refined between the 1680s and 1730s. What made her such a standout? Her extraordinary skills. Gu Erniang was a remarkable woman who thrived in a field dominated by men; she became more famous than her male colleagues. Her name was associated with technical and artistic innovations as well as refined taste. It is also interesting to mention that she enjoyed more gender freedom than her genteel sisters in that she could receive male patrons in her studio to discuss commissioned projects face-to-face. How has the significance of inkstone artisans changed over time? Gu Erniang was one of the first inkstone makers in China to attach her signature mark on her work, suggesting a heightened respect that exceptional artisans like her enjoyed. Today, because the inkstone is no longer a functional object, all inkstone artisans have to present themselves as creative artists. What interests you most in this topic area and what are some of the biggest “ah ha!” moments you had conducting research for the book? I love all the modern conveniences we enjoy but increasingly feel the need to look back and reassess the heavy price we pay for such “industrial development” or “progress.” I became interested in the craftsmen because theirs was a sustainable livelihood that was environmentally responsible. Through their eyes, I arrive at tentative answers to my big question at the moment: What makes work meaningful? The craftsman’s answer: Making one-of-a-kind objects with attention and skill in a collaborative environment. Craft makes us more human by inspiring us to strive for perfection. How does the research conducted for this book connect to research from your previous publications on footbinding and Chinese feminism? As a historian of gender, I’m sensitive to power inequalities and trained to analyze the operations of power. In the same way that I had retrieved women in Chinese history in my earlier books, I set out to retrieve the artisans from erasure in the hands of male scholars. Little did I know that the latter turned out to be a far more difficult project. This entry was posted in Art and Art History, Asian Art, Asian Studies, China, Guest Post, Q&A, Science and Technology Studies, Visual Studies and tagged art history, Dorothy Ko, Q&A, The Social Life of Inkstones on May 10, 2017 by uwpressblog. Today we speak with Queering Contemporary Asian American Art editors Laura Kina and Jan Christian Bernabe about their groundbreaking volume, published this spring, and corresponding website. Queering Contemporary Asian American Art takes Asian American differences as its point of departure for bringing together artists and scholars pushing back against normative assumptions, expectations, critiques, and practices within Asian American art and visual culture. Taken together, these nine original artist interviews, cutting-edge visual artworks, and seven critical essays explore contemporary currents and experiences within Asian American art, including the multiple axes of race and identity; queer bodies and forms; kinship and affect; and digital identities and performances. The interdisciplinary and theoretically informed frameworks in the volume engage readers to understand global and historical processes through contemporary Asian American artistic production. Why did you want to put together this book? Laura Kina and Jan Christian Bernabe: Most of the contributors of Queering Contemporary Asian American Art met at a 2012 National Endowment for the Humanities supported summer institute entitled “Re-envisioning American Art History: Asian American Art, Research, and Teaching” at the Asian/Pacific/American Institute at New York University. There we discussed the ways in which we could advance the field of Asian American art history through our teaching, writing, and curatorial projects. We wanted to heed Higa’s call to find innovative and timely ways to work on Asian American art history and thus formed a group at the seminar called “Que(e)rying Asian American Art,” for which the title of our book is named. We saw intense interest by the members of the group to think about the ways in which queer theory could inform Asian American art criticism. In many ways, the discussions we had during the seminar and at many conferences after the seminar had ended informed the creation of our book. We like to think that our book is a product of our termite activities. What was it like writing and putting together this kind of volume? LK & JCB: The process of writing the book was extremely intense but exhilarating! We invited seven authors to write critical essays for the anthology and in total we interviewed 17 artists, from emerging to established in their careers. We started the process of interviewing during the summer of 2014 with genderqueer and transgender artists in Chicago: Kiam Marcelo Junio and Greyson Hong, respectively. What do you hope is the book’s most important contribution? LK & JCB: We hope our book builds on a queer of color critique and advances the field of Asian American art and contemporary art. The book is a call to build queer coalitions of resistance, to push back against the dominant “model minority” paradigm in Asian America of assimilationist “good” behavior—of not making waves and being silent and complicit in the face of anti-blackness, Islamophobia, homophobia, transphobia, and so forth that pervades US culture. LK & JCB: The artwork is the most important thing. On a basic level, we just want to introduce the important work of the artists and scholars in this book to a wider audience. On a broader level, we want to inspire readers to form their own queer coalitional politics; we are writing to bring together feminists and queer of color artists and scholars to take up our “termite activities” and keep on nibbling at the hegemonic foundations of art history. Laura Kina is an artist and a Vincent de Paul Professor of Art, Media, and Design at DePaul University. She is the coeditor of War Baby / Love Child: Mixed Race Asian American Art. Jan Christian Bernabe is the operations, new media, and curatorial director at the Center for Art and Thought. The contributors are Mariam B. Lam, Eun Jung Park, Alpesh Kantilal Patel, Valerie Soe, and Harrod J Suarez. Featured artists are Anida Yoeu Ali, Kim Anno, Eliza Barrios, Sita Kuratomi Bhaumik, Wafaa Bilal, Hasan Elahi, Greyson Hong, Kiam Marcelo Junio, Lin + Lam (H. Lan Thao Lam and Lana Lin), Viet Le, Maya Mackrandilal, Zavé Martohardjono, Jeffrey Augustine Songco, Tina Takemoto, Kenneth Tam, and Saya Woolfalk. This entry was posted in Art and Art History, Asian American Studies, Events, Gender Studies, Performing Arts, Politics, Q&A, Sexuality Studies, Visual Studies, Women's Studies and tagged art history, Asian American Art, Jan Christian Bernabe, Laura Kina, LGBTQ, Q&A, Queering Contemporary Asian American Art on May 5, 2017 by uwpressblog.